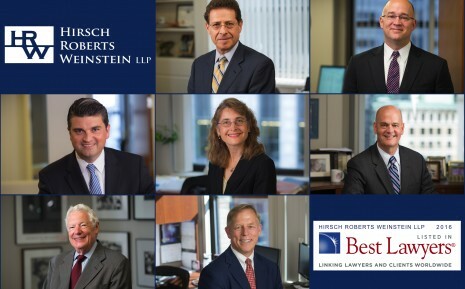 Seven attorneys from Hirsch Roberts Weinstein LLP have been selected by their peers for inclusion in the 22nd Edition of The Best Lawyers in America®. In addition to having seven lawyers listed in five different practice areas, HRW was also “Top Listed” in both Massachusetts and Boston in the area of Litigation – Labor and Employment with six lawyers listed. In order to receive the “Top Listed” designation a law firm needs to have the most listed lawyers in a particular location and practice area. David B. Wilson – Employment Law – Management, Litigation – Labor and Employment. Best Lawyers is an established and well-respected peer-reviewed publication for the legal profession. In order to be honored with inclusion in this list, an attorney must receive enough positive votes from his or her peers as reflected in the results of a comprehensive survey. The 22nd Edition of The Best Lawyers in America® was based on over 6.7 million evaluations of lawyers completed by tens of thousands of lawyers.